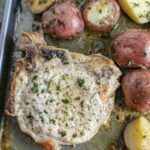 Ranch Pork Chops and Potatoes Sheet Pan Dinner is a breeze to make and a even easier to clean up! 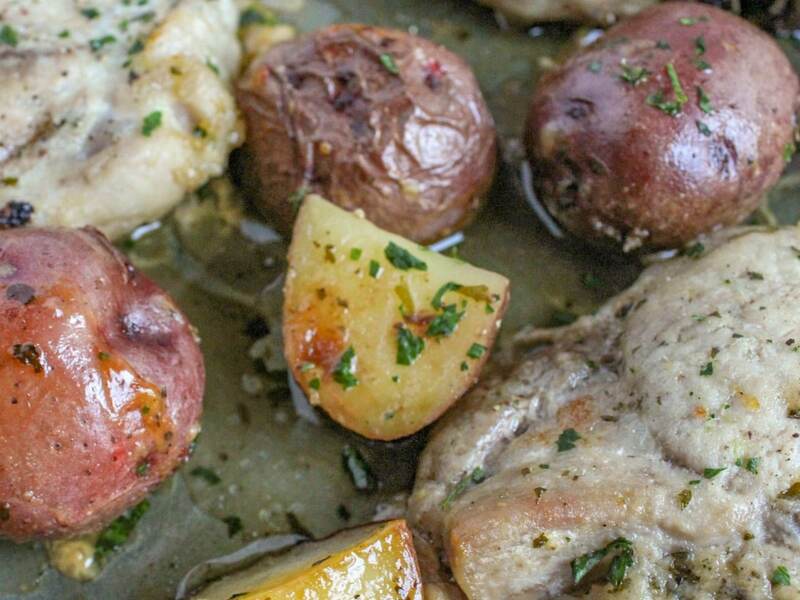 It’s a whole delicious family friendly dinner in just 30 minutes in one pan! I know when most people think of ranch flavor they think of salad dressing BUT there’s so much more you can do it with it. Like using a packet to make these fun savory Ranch Seasoned Oyster Crackers or for adding extra flavor to pork chops like in this recipe. 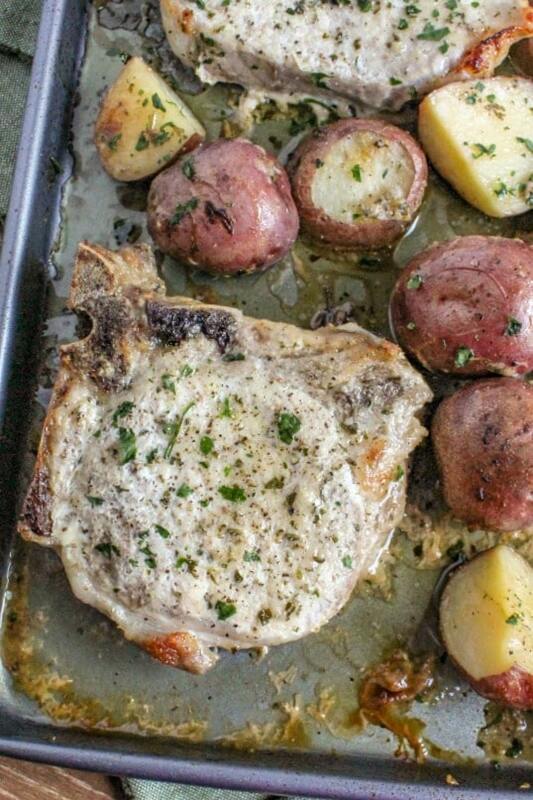 Sheet pan dinners like this One Pan Ranch Pork Chops and Potatoes are super easy. They are easy to prep. They are easy to cook. They are easy to clean up after. See there’s a theme here: EASY! Who doesn’t love an easy dinner? I know I’m a huge fan! This meal takes about 10 minutes to prep and just 30 minutes in the oven. Really it does’t get easier than that! The length of time you need to bake a pork chop in the oven depends on the thickness of the meat as well as if is a bone in pork chop or not. Thick cut, around one inch, bone in pork need to cook at 400º for thirty minutes. Thick cut boneless pork chops take around 25 minutes at the same temperature. Pork chops are fully cooked at an internal temperature of 145 degrees. 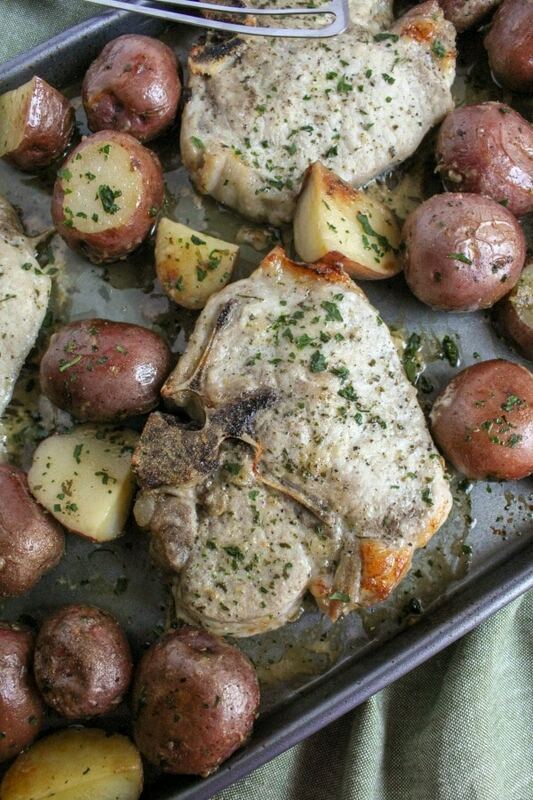 Since the potatoes will need a little longer to cook than the pork chops I recommend putting the potatoes in the oven 10 minutes before the pork chops to give them a bit of a head start. For even easier clean-up you may want to line your baking sheet with foil and treat it with a little non-stick spray. In a small bowl whisk together olive oil, melted butter, garlic, onion powder, and ranch seasoning. Place potatoes in a single layer on backing sheet then drizzle about half of the seasoning mixture over the top of the potatoes and toss to coat. Bake potatoes in the oven for about 10 minutes to give them a head start on cooking since they will take a little longer than the pork chops. 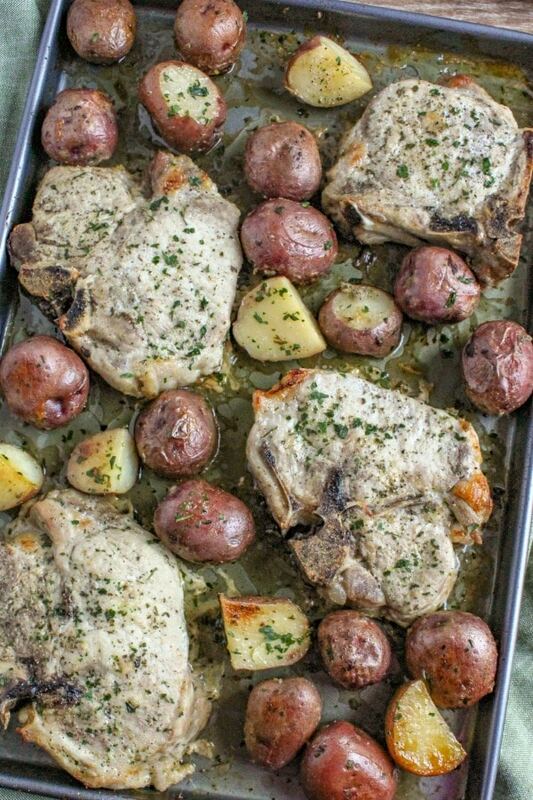 At the end of 10 minuets remove the potatoes and arrange the pork chops on the baking sheet with potatoes. Brush on the remaining seasoning mixture over both sides of the pork chops. Then return to the oven for 20 minutes or until the pork chops are cooked through. If using a meat thermometer when the pork chops reach internal temperature of 145 degrees. Oh yum! I love making sheet pan meals for dinner, they are so easy! I can’t wait to try this one! This is soooooo delicious! I love an easy and tasty dinner recipe and this fits the bill!